I actually spotted a few Canadian Tuxedos when I was at Rowe today – thank you James Jeans trunk show – but this adorable double denim ensemble rolled in right after I left. Fortunately Owner Maren Roth snapped a photo and sent it my way. 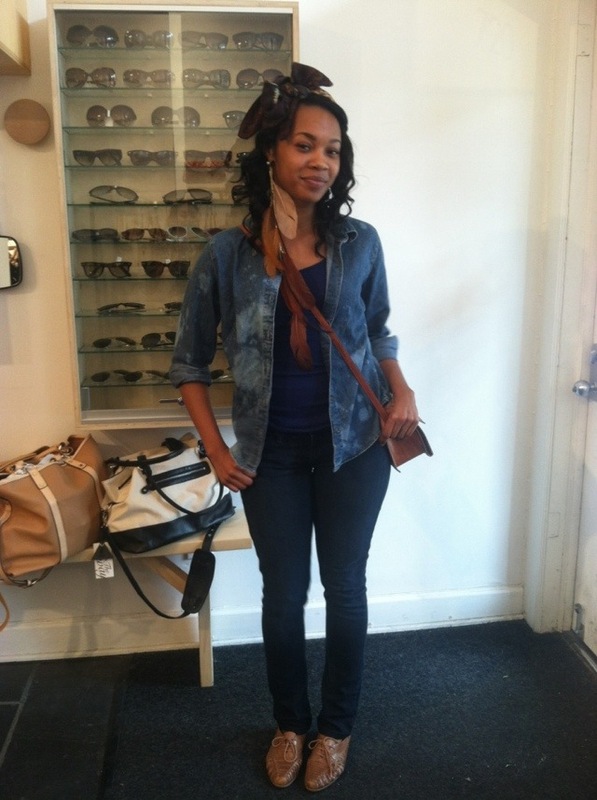 Here is Queair in Levi’s jeans and a denim thrift shirt. More from the James Jeans trunk show and my latest spin on the Canadian Tuxedo to come! If you’re in Columbus, be sure to swing by Rowe tonight between 5:00 and 7:00 for a special cocktail hour and some very colorful denim. This entry was posted on Tuesday, May 22nd, 2012 at 1:14 pm	and tagged with Canadian Tuxedo, Columbus, Denim, Denim on Denim, Fashion, James Jeans, Levi's, Maren Roth, Ohio, Rowe, Rowe Boutique, Short North, Vintage and posted in In The Wild. You can follow any responses to this entry through the RSS 2.0 feed.